Delivery time: This item is made to order, allow 5-7 days for delivery. 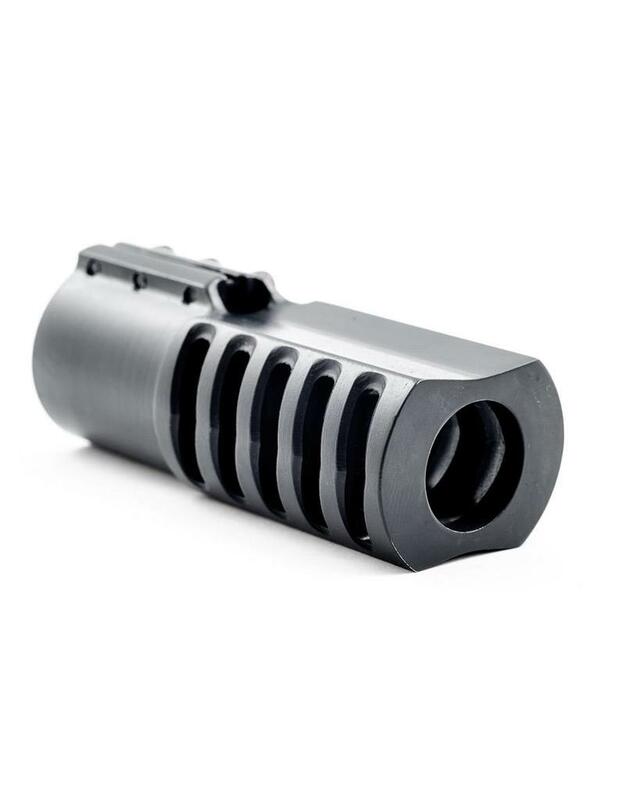 Our new clamp on muzzle brakes have been precision CNC machined from 1 ½ inch 416 stainless and offer a substantial reduction in felt recoil and muzzle rise. 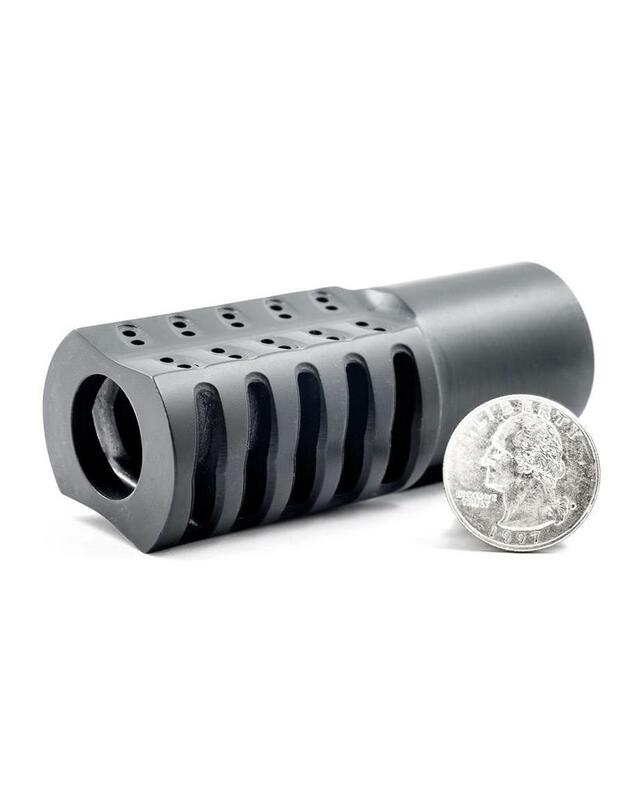 A felt recoil reduction of up to 60% or more can be expected; significantly improving comfort during firing, as well as faster follow up shots. 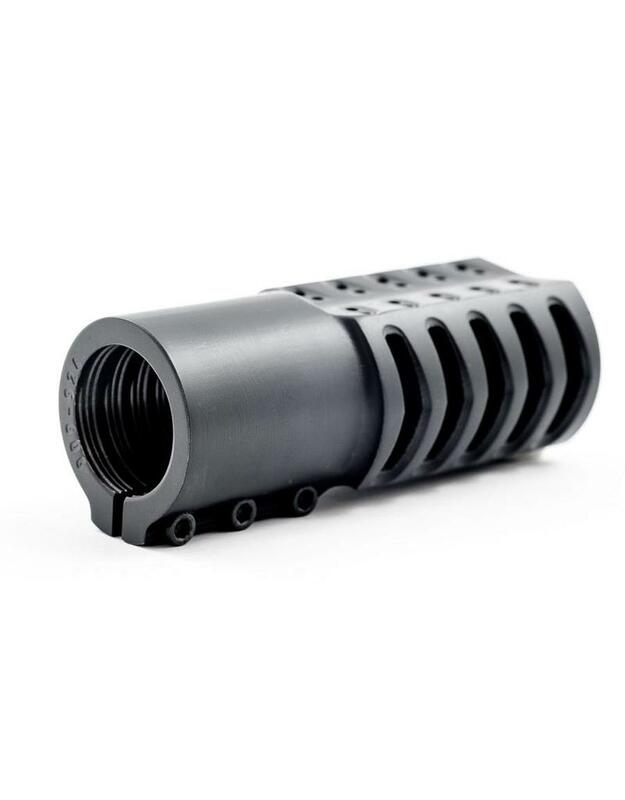 During testing we found that the 5 port design makes the most efficient use of the available gasses exiting the barrel to substantially reduce recoil. There are 20 .078" holes drilled into the top of the brake that vent gas in order to stop muzzle rise. The bottom of the brakes have no holes or ports to kick up dirt all over the shooter. Having the bottom of the brake angled outward also helps to reduce muzzle rise. 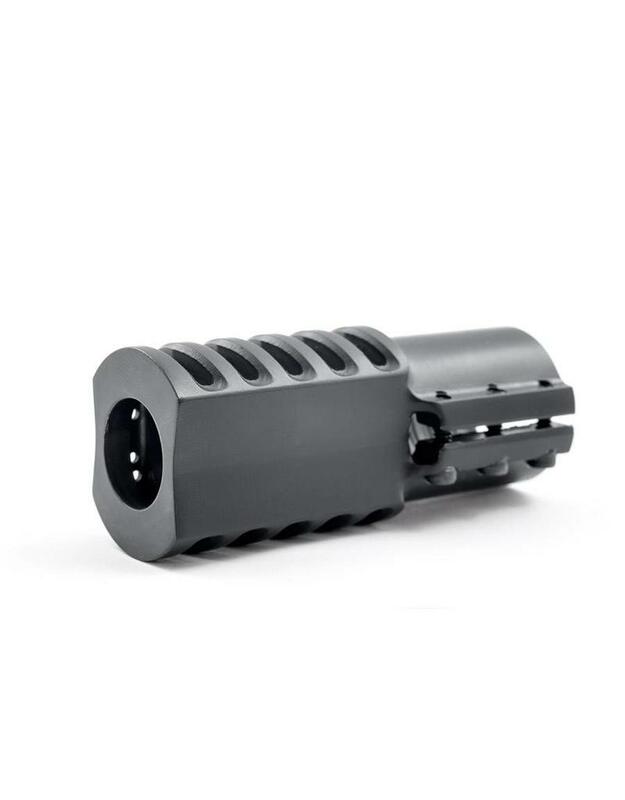 After months of testing and development the design of these brakes make them the most efficient clamp on muzzle brakes available today. 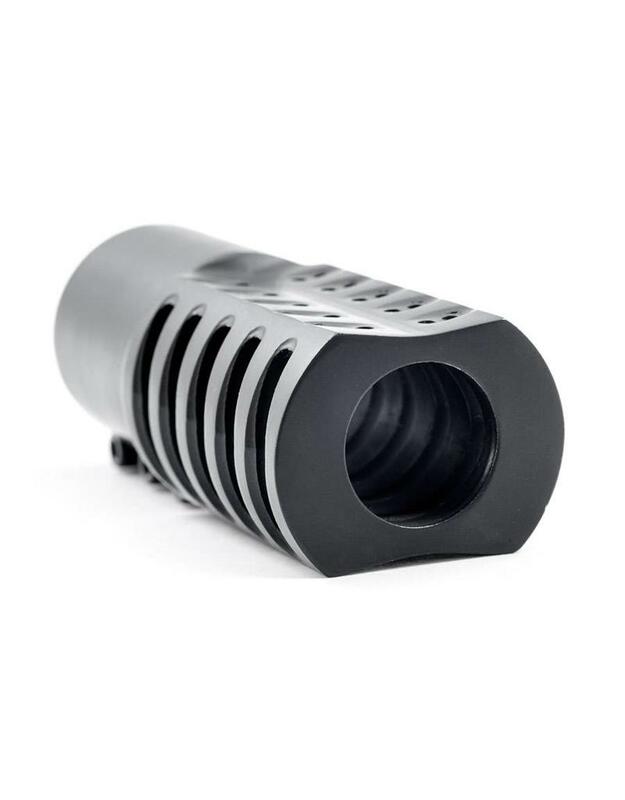 As part of our manufacturing process after the muzzle brakes are machined they are finished with a large vibratory tumbler using Ceramic media in order to provide a smooth matte finish. 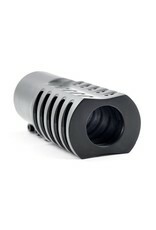 The brakes can be used as is, or painted/coated with any of the gun coatings commercially available. We also offer Cerakote coating on all of our brakes. 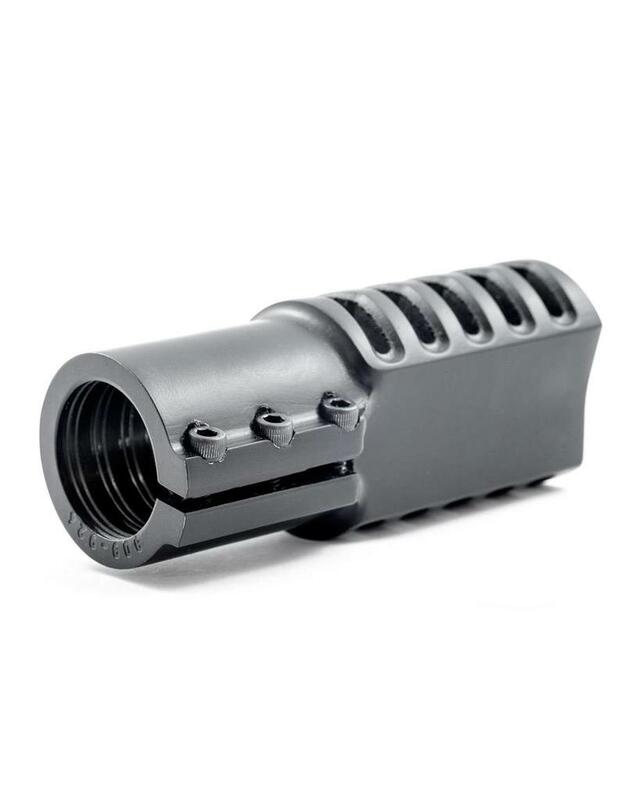 These new patent pending muzzle brakes require no permanent modification to the original firearm and can be installed using simple hand tools. No gunsmithing required. In case of measurement error we do re-cut the brakes at no charge, however, please be as precise as possible in the measuring so we can continue this service for everyone. 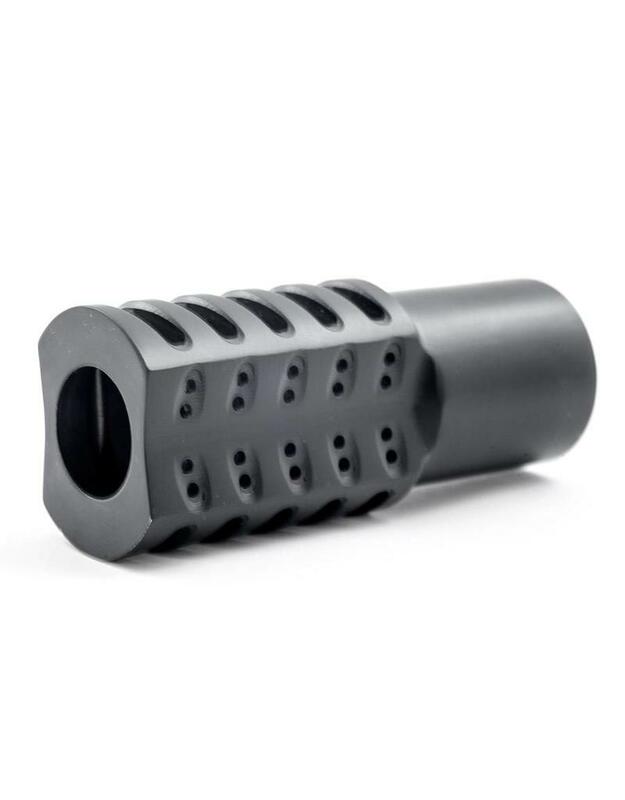 We ask for barrel measurements at the muzzle and 1 1/2" from the muzzle in thousandths of an inch or hundredths of a mm, to make sure your new brake fits right the first time. Please see Measuring Information for details. Our Muzzle Brakes are made to order! Please allow 5-7 days for your custom order to ship. You will receive a confirmation email as soon as your order is shipped. All of our products are 100% guaranteed. 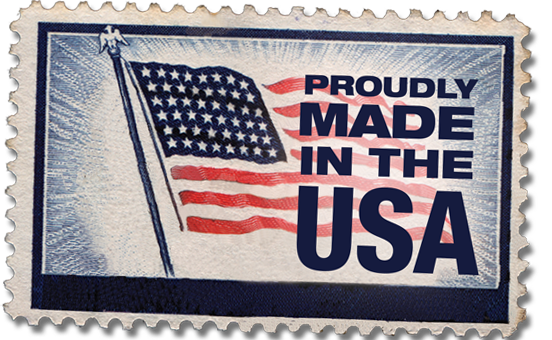 If you don't like it for any reason we buy it back, including shipping, no questions asked. I bought the break a few months ago an just got to use it. I couldn't believe the difference it made on my 270. My buddy wouldn't have believed it until he shot it an he needs shoulder Surgery an he loves it even had my 7yr old son shoot it its very well made an crafted. Had shoulder surgery a while back, and shooting my 300 Win mag was not funny any more. 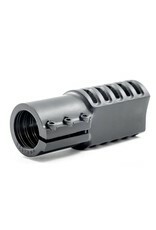 The Clamp on muzzle brake has made it my favorite hunting rifle again..... Thanks Witt Machine ! functions superbly, fair price, quick service. installation was very easy and fast. 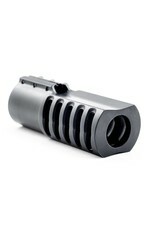 I will purchase one for the 338 and 308. Installed on a New England Arms 12ga single shot shotgun. This is a "Turkey Gun" project I'm working on. 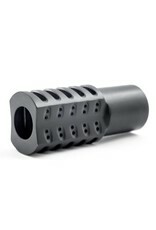 Tested; and it turned a punishing recoil of 3 inch Magnums into a heavy push. I hadn't notice any changes on the pattern either, the barrel is a factory full choke and patterns well to 40 yards. Using the brake as a giant "bead" sight is working well also. Fitted perfect, slid on with no "play" and tighten nicely. Thanks again. loads.My brother has same TC he couldn't believe it now he will be ordering also thank you. Keep up the great work.